Vestibular Rehabilitation is an exercise and movement-based approach for the treatment of dizziness and balance problems. This treatment can be effective for people of all ages regardless of how long the symptoms have been occurring. Treatment can consist of hands-on techniques to reduce symptoms or an individualized exercise program (or both!). How do I know if I need Vestibular Rehabilitation? If you have dizziness, imbalance, vertigo, frequent falls, concussion or blurred vision that your doctor feels may be related to your inner ear, then vestibular rehabilitation may help. The following document can help you determine whether vestibular rehabilitation is appropriate for your condition: How do I know if I have a vestibular disorder? 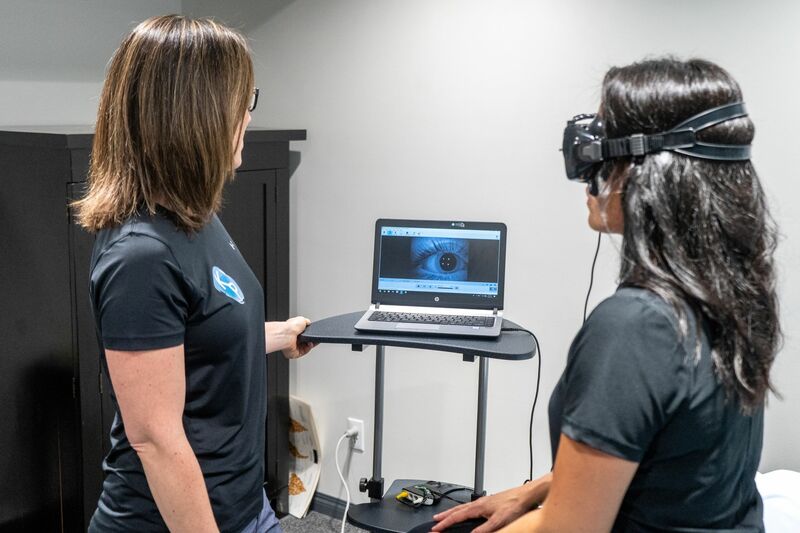 Vestibular rehabilitation programs are designed to decrease vertigo and disequilibrium associated with peripheral vestibular abnormalities or musculoskeletal conditions causing dizziness and imbalance. There are many causes of dizziness, not all the result of vestibular and musculoskeletal deficits. It is recommended that patients entering a therapy program have seen their family doctor, or a specialist regarding their symptoms. Typically the specialist will be an otolaryngologist or a neurologist. Our therapists are trained in vestibular rehabilitation and concussion treatment with strong backgrounds in musculoskeletal treatment. We can assess and treat most vestibular conditions. The vestibular system is an apparatus deep in the ear that senses movement of the head and sends information to the brain about the head’s position in space. This contributes to a sense of balance and equilibrium. When the vestibular system is not working appropriately the brain receives faulty information and produces symptoms such as dizziness, vertigo, and imbalance. BPPV causes vertigo and imbalance due to debris that is displaced in the vestibular apparatus. When you are suffering from this condition a simple head tilt or lying down can trigger vertigo. These episodes of vertigo are intermittent and may resolve on their own and return again spontaneously. BPPV can occur with no specific cause, but can also be triggered by head injury, whiplash, vestibular damage, aging, or infection. The treatment for BPPV is fairly straight forward and typically very successful on the first visit! Occasionally problems with the neck can trigger dizziness. A physiotherapist can assess your cervical spine and determine whether your symptoms are derived from your spine, or of vestibular origin. The vestibular system can be damaged in many ways: viral infections (labyrinthitis, vestibular neuritis), fluctuating fluid levels in the inner ear (Meniere’s Disease), trauma from head injury (vestibular concussion), benign tumours and degeneration from aging. When the vestibular system is damaged it has little ability to repair itself. The body recovers by having part of the brain that controls balance re-calibrate itself to compensate for the unmatched signals being sent from the damaged and well ears. This compensation occurs naturally in most people. Some patients require help from vestibular rehabilitation exercises in order to recover from an injury to the vestibular system.